Yesterday was a doozy, and one of our very wide-berth limit orders filled in the carnage. In this market, you have to set the price you think is reasonable, then lower that 20% to where you think it’s just too cheap to be true, then take another 20% off that and you’ll still see the order fill. Notice that it’s back up at the $200 line, a level it pierced only in November’s crescendo crash, but turned back from sharply in January and February. Unfortunately, each of those tops was accompanied by an RSI higher than the current 62. Nonetheless, anybody holding this would be wise to have a trailing stop in place. That being so, the opposite trade beckons, does it not? 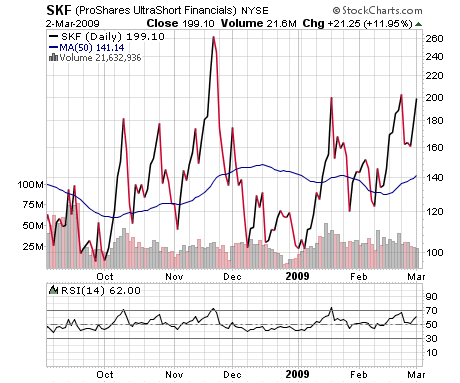 SKF’s inverse, ProShares Ultra Financials (UYG) should now be nearing oversold conditions at an RSI of 30, and it is: 33. These are two to watch for the rest of the week.